Among the most marginalized people in the world are the first mothers of adopted Ethiopian children. Many of these women would not place their children for adoption were it not for abject poverty. Since 1999, about 13,000 children have been placed in the US from Ethiopia. Many of their mothers never hear from, or even about, their children ever again. These women don’t have access to the Internet or support groups or media. They often live in isolation, with their memories and sorrow. I have yet to hear about US adoption agencies offering significant post-placement services to Ethiopian first mothers, in their language, with cultural competence. Fewer children are being placed from Ethiopia. Adoption agencies aren’t working there as much anymore. So what happens to the first families? What sort of grief and loss counseling do adoption agencies provide to the first families? Who do the first mothers turn to when they desperately miss their children, or want to know if they are alive? We are missing so much in adoption. So much. Families are supposed to send updates to Ethiopia. Some do, some don’t. There’s a lot of anger and mistrust, among families, agencies, government workers. My sense is, in any case, that most reports don’t get to the people who most deserve them: the first families. The mothers. US adoption agencies do gather information about why children are placed for adoption. Increasingly, though, adoptees and adoptive families learn the information is inaccurate, or, worse, horrifically fraudulent. What are the true stories, and will anyone really know what they are? What about the stories of the first mothers? Who listens to them, and records the family stories, and saves them for their children? Who values those stories? I’ve begun working on a couple of exciting possibilities to change things. One project is to create a network–an infrastructure–that delivers, to Ethiopian first parents, reports from US adoptive parents about their Ethiopian children. The reports would be in the Ethiopian parents’ language, and would be read to them if they are illiterate. Yes, photos too. Another project is to work with Ethiopian first mothers, and preserve their personal histories. What a huge honor that would be. I belong to the Association of Personal Historians, and last month presented a workshop “Rebuilding Personal Histories” at the annual conference about personal histories for adoptees and others separated from their original family history. I’ve since talked with a few folks about doing this work with Ethiopian first mothers. Would that not be amazing? So, I ask you to accompany me on this journey, in any way you can. Feel free to post here, or to email me at Maureen@LightOfDayStories.com. No mother should suffer not knowing what happened to her child. We can change this. This entry was posted in adoptees, birth/first family, Ethiopian adoptees, Ethiopian mothers, first mothers, Personal histories and tagged adoption agencies, Association of Personal Historians, birth/first parents, Ethiopian adoption, international adoption by Light Of Day Stories. Bookmark the permalink. I adopted my daughter as a 5 month old baby, & she turned 15 today. The paperwork that I was given at allocation stated that she was born to a 16 year old girl who abandoned her in hospital the day after she was born. When I went over to pick her up, I also went to the hospital that I had been told she was born, only to find that it was actually incorrect and so I went to the true hospital (with our wonderful English speaking taxi driver as my interpreter) and found that she was in fact 6 weeks older, but I got all of her birth info plus a birth certificate. Four years later we returned and after a full day of investigating and travelling around the countryside, we found her birth family which included a little sister who was 1 year and 3 weeks younger than my daughter. My daughter’s face is a clone of her fathers! We have been back 3 more times since then, plus we email and Facebook to stay in touch. In 5 days we are going back to Addis to bring the younger sister her to live with us and attend high school on a Student Visa for the next 6 years. It is not an adoption. I hate that I was lied to about her age, birth hospital, the spelling of her name, the fact that there is a father, and that the overcrowded foster home my daughter lived in for a couple of months was a horror run by an extremely greedy man and wife. It is very sad that lies and corruption appear to go hand in hand with Ethiopian adoption, and I feel for those who have been so hurt by those people that we put so much trust in. We have ended up with many positives, but we have many friends who have no way of learning more than what was printed on that half page of information at allocation time. Other friends have been able to gather information, and it almost always ends up with finding out about living family. Thank you for standing up for our kids and their first mums. What I would love to see is a place for mothers to register their and their child’s details so children who were abandoned may have a chance to reconnect with their parents as well. I don’t even know how this could be approached. I’m with you and will help in any way I can. We have some contact with our family. We hire someone to bring mail about once a year. He records them receiving the mail so that we know they have it and he asks questions that we send (how are you? Is everyone healthy and doing OK?) There are so many questions I have. Should I send my sons kindergarten report card? His drawings? Could they get to an internet so that they could see him talking? What of his mother’s family? Could they share stories of her? What will all this mean as my son gets older? What is culturally appropriate? Is it possible to share too much when my son is young? So many questions. Thank you so much for starting this. And yes, a history! Wonderful and so important. Tell me what you need. I would be thrilled to help. I am very interested. I ave two children from Ethiopia, ages 10 and 2. HI Maureen – we are an adoptive family from Ghana, West Africa. While our story is a little different, we stay in contact with my daughter’s foster family who is able to get information to our birth mother. Each year we send a shutter fly photo book of my daughter’s year. We know she has been receiving it bc we then receive an email with a picture of mom holding the book. That might be a nice way to help break language barriers. Pictures speak a 1000 words. This is a very noble and lasting legacy you are building. EXCELLENT. I cannot wait to see what you do here! And if you find yourself looking for help… well, I sure would be interested to know how I might be useful to you! I’m glad you landed here also. Welcome. And thank you for your good wishes. Stories matter so much. I have sent this post to a dear friend of mine, a Radio Documentarian who will be heading to Ethiopia to train journalists on audio work. He is a spectacular human being, and an adoptee himself. I hope he will contact you. And I concur, I would love it if first fathers were also included in this project. Sue, thank you very much for forwarding the post on to your friend. I also hope he will contact me. His perspective is so valuable. We will do our best to be as inclusive as possible, while being responsible about goals and resources. Thanks! Jenny, you’ve articulated the complexity well. Thank you. I know many Ethiopian adoptees who have siblings (older and younger) who are not placed for adoption, and that is complicated too. Still, the connections matter so much, as you well know. I welcome you on this journey. Thank you. I would love to join you on this journey. We were just in Addis picking up our second daughter and got to meet our first daughter’s birth mother. We were very upset to learn that she had not received ANY of the six post adoption reports and several pictures that we had sent. The conversation was stiff given the interpreter (agency representative). We also learned that our daughter had been raised by her grandmother. Including grandparents when applicable would be fantastic too. Having pictures of our daughter’s Ethiopian mother and grandmother has helped our little girl so much. She was afraid that they had died. She is now reassured and treasures the photos of her family. We also learned some stories about her early years that our daughter loved hearing- her history, priceless. Michelle, what happened in your family is unfortunately common in regard to the post-adoption reports. As a grandmother, I agree with including grandparents–and I’m aware that grandparents are often closely involved with raising their grandchildren in Ethiopia, and with placing them for adoption. Stories matter, and can bring great healing. Thank you. A mother’s history would be priceless to us. There’s only so much info you can get through an investigator. I’m grateful to have somewhat regular, if stilted, contact with our first family, but to get the family story….wow. Yes, the accurate story of how a child came to need to be adopted is important, and it’s only part of the child’s history. Thanks. We have been fortunate to have been “found” by a family in the Netherlands who adopted my daughter’s sister, when she was aged 4. My daughter was 7 months old when I brought her to the U.S. and her papers had the typical “abandoned by the side of the road” narrative. Her sister talked of a baby sister being taken away, and thankfully, her adoptive family hired someone to investigate and find us through our adoption agency. We have had a relationship by email for a couple of years and finally met in the spring when they came to the U.S. for two weeks. 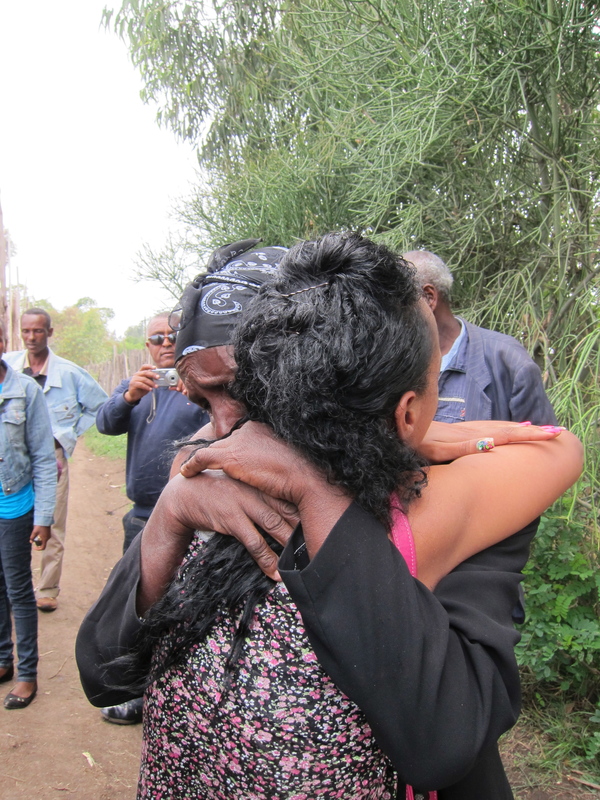 Both families reunited our girls with their Ethiopian grandmother in Ethiopia in October – it was the first time she had seen both girls together since my daughter left her home in early 2006. This was a trip of a lifetime – so poignant and moving and healing for their Grandmother. She went from deep sadness at the start of the trip to joyful engagement with both girls several days in. Her daughter, my child’s first mother, died after childbirth and there is no known father. The Grandmother simply could not care for both children alone. This was a “cleaner” story in that there was no corruption or false pretenses under which the girls were relinquished. Nonetheless, it is unfathomable to any of us with privilege to imagine what it must be like to have to make this choice. She said she could be at peace now, knowing both girls are happy and loved and she will see us again. I wish for every family to have the chance to know their child’s true story – the real birthdate, the story of what happened, the ways that the child is like their biological parent(s) or not… all of this has been such a gift. I am so glad you are bringing focus to this issue of finding the first parent(s). What an incredible story. Thank you. I had chills reading it. As a grandmother myself, I can only imagine what the girls’ Ethiopian grandmother went through. To know now that she has some peace, that she knows the girls are alive and connected–amazing. Chills. So many gifts. Please keep connected with us on this journey. What a moving story. Thank you for sharing it. Fathers, too. And grandparents. And siblings. Absolutely. We do not have any intent to be exclusionary. We do want to be pragmatic about what we can do, and focused on realistic goals. That said, we will do our best to reach as many people as possible. Thanks. I agree with this … our adopted son from S. Ethiopia was relinquished because his mother died. So any first family member to me is important (we have established ongoing communication with the first family and it’s been fantastic to have). This is such a good idea! As an mom of an adopted Ethiopian daughter who has a living birth mom in Ethiopia I can really relate to this issue. Our agency is done and we have had no way to contact our daughters birth mom. I am not even sure when we were doing the yearly reports that her mother even saw them or that they were translated for her. After 7 years and God’s intervention we now we have made contact with our daughters’ family but it was a very difficult 6 years for my daughter emotionally and I am sure for her Ethiopian mother. I am very interested in being an active part of this if I can help in any way. Please contact me via e-mail. Thank you very much. Your story–your daughter’s story–is incredibly powerful. I’d be grateful for your participation, and will keep in touch. It took me four years of search, along the way being hit with roadblocks and setbacks, to finally find our daughter’s birth mother and half sister. Through my found intermediary, who translates, guides, and facilitates our connection, we are now in regular contact. The journey has just begun, yet the increase in our daughter’s sense of self, cultural pride, feelings of connectedness, albeit longing as well, is profound. I am interested in becoming an active part of Maureen’s community in this regard. As a memoirist, with a Master’s Degree in Biography/Autobiography, I find no more important self “work” than knowing from where we came. Without this foundation, which lies underneath the mulch we use to grow our identities in this world, there can be, in my opinion, no self-actualization. Without becoming self-realized in this life, we have not fully blossomed. It is my job as my daughter’s only mother with whom she lives, to do whatever I can to facilitate in her a curiosity and passion to become self-realized. Knowing–and loving–the woman who gave her birth is the first step. Dina, I so appreciate your generous heart. Thank you for these helpful, insightful words. I would of course welcome you wholeheartedly on this journey. I look forward to it! Many thanks. I agree that the current situation is appalling, both in terms of what Ethiopian families were falsely promised in the way of contact, and also in how much the original (albeit ineffective) systems have broken down (closed orphanages, etc.) The mothers, as you say, are the most marginalized – but let’s remember the fathers too. And brothers and sisters and grandparents, of course, but on my recent trip I met a lot of fathers who were also desperate for news of their children. I will never forget the look on one man’s face when he realized the book I was holding was full of pictures of his daughter. He had heard nothing of her for three years – even though the adoptive family had been faithfully sending post-placement reports. As for the personal histories, I do think there are some potential pitfalls there – one being whether you would get the true story, even now, if there was any perception that the interviewer was affiliated with government, or agencies, or officialdom of any sort (for want of a better word.) The other is whether there could be any repercussions to families for sharing stories that contradict the official records – eg for a family member who may have gone along with a false story in court for a variety of reasons. I would be nervous about those sorts of stories being made public. You can use pseudonyms and change details to conceal identities, of course, but then you do lose a significant part of the personal history aspect. I’ll be interested to hear what comes of your ideas! Thanks very much! No disagreement about the fathers, grandparents, siblings, etc.–we are not intending to be exclusive, but do want to be realistic about what we can achieve, at least to start. And indeed there are pitfalls to the personal histories, in terms of confidentiality, cultural differences, privacy. Still, I think there are ways to listen to the stories and preserve them that are pragmatic and respectful. We mean to go into this with eyes wide open. Thanks again for your thoughtful comments. I’m also very interested in this subject. I think there should be some sort of nonprofit created to ensure the channels of communication are open: a non-profit, neutral third party, in other words, to step in where the system and all the promises have failed . . . Excellent point about the need for neutrality. I think our hope is to create a system that is of course legal and transparent, and that allows for independent action. I’m not begin facetious when I say that’s a lofty goal. Small steps. Thanks for your interest. Please continue to weigh in. Maureen, what a wonderful idea. I’m eager to observe what specifics you come up with to realize it. Really, very interested. Here’s why: Over the year it took to write my book about searching for my child’s history, I talked to several dozen APs of Cambodian children about what I was doing and why. Nearly all of them expressed a longing to make a connection, to give information, to be accountable for their caretaking of their adopted children, to the only people who have a right to know–their first families. So that’s where we got stuck. So few of our kids have any validated identity info that we wondered how to hold the reports so that only their own first families would have access, given that most APs can’t give a list of who gets access. In the form of a specific question: Do you imagine this resource as something that would be accessed by placing families who are known to the a-families already? Or is there an element of search/reunion as well? This is a really interesting and important idea that could potentially reach beyond Ethiopia and around the world. Our kids deserve better. Alex, thanks for your comments. We are in early stages of this project, so I don’t have ready answers. I very much appreciate the questions–they are pivotal right now. My hope is that we might create a model that could be replicated, though I’m well aware of how very different each country and culture can be. I welcome your ideas, thoughts, and insights as we move ahead. In reflecting more on this, and on David Smolin’s recent article on the unique role of the US in ICA (linked at Fleas Biting), it seems to me that part of what’s hard and potentially revolutionary here is how similar the needs are. Yes, there are cultural distinctions, but at some level what’s common–children who were removed, sometimes without proper consent, failure to keep promises to placing parents, identities often obscured to smooth the path for a predictable US placement–looms large. At the very least, any functional model for creating connections that fills the gap will have many applications. I’m emailing you this evening with my notes from those interviews, because they might be helpful. Maureen, I am all ears. As we have talked about, this is an issue I feel so strongly about too. This is definitely a journey I — and many others I’m sure — will want to accompany you on. Thanks very much, Chris. I believe we can make some positive changes, and would be grateful to have you alongside for the journey. I think about this every day and would love to help! In my sons case it is his birth father. I have been able to get photos to him one time but it is not easy as there is no post office in his village. I would love to see a network to help this…and to possibly help those same birth parents with resources to help if they have other children at home (or will in the future). I am hoping to move there at some point to help out with these things and would love to add a birth mother/father support and communication network as a component!